A theatre and film director, writer and producer – he most recently wrote and directed BLOOD RED LINES during a a six month residency with the Derry Playhouse based in South Armagh and Border counties. The work was concerned thematically with the tragedies that occurred in the South Armagh and Border counties region in the darkest days of The Conflict. Robert’s professional career began in 1982 working with John McGrath and 7:84 Theatre Company England. 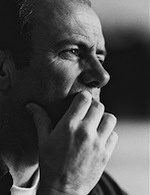 From 86 – 96 he worked as freelance director, writer and producer with small and middle scale touring companies and on a number of large scale community plays. From 96 to 2014 Robert was Artistic Director & Chief Executive of Theatre Workshop Scotland. He directed two feature films and numerous professional and community shows, his preferred way of working placing the people whose story is being told at the heart of the creative process. Celebrating diversity and challenging attitudes that exclude – his championing of the employment of professional disabled actors transformed the disability arts scene in Scotland. He has worked with theatre companies Nicaragua, India, Poland and Japan, and was honoured that his first feature film TROUBLE SLEEPING was selected as the opening film for Amnesty India’s International Festival marking the 60th Anniversary Celebrations of the Declaration of Human Rights in Delhi. More recently THE HAPPY LANDS, an ambitious period feature made with the Fife Mining Community premiered at the Glasgow Film Festival before being distributed by Soda Pictures, Picturehouse and Distrify. Theatre shows include; THE THREEPENNY OPERA by Brecht (Festival Theatre & Tramway), ENDGAME by Beckett (Arches & Tour), BABYLON BURNING, BLACK SUN OVER GENOA (Festival Theatre & Tramway), OH WHAT A LOVLEY WAR!, PORTADOWN BLUES, I AM THE WALRUS by Nabil Shaban, THE JASMINE ROAD & ONE HOUR BEFORE SUNSHINE by Ghazi Hussein (Touring), GILLIAN CULLAIG/HOGMANAY BOYS, KAGAYUHIME, JACK IN THE LAND OF DREAMS by Stanley Robertson (Christmas Shows), JIMMY C!, CONSIDER RATHER THE RIVER, (writer) STOCKAREE (Community Plays) and DARE, IF I DIE B 4 U WAKE and SQUEELIN LIKE A PIG by Debbie Issit. Producer, 7: 84 Theatre Company England, (’83 -­ ’86) THE GARDEN OF ENGLAND, SIX MEN OF DORSET by Miles Malleson and Harry Brooks, SCHOOL FOR EMIGRANTS by Paul Thompson (with Theatre Passe Muraille, Toronto,) SPIKE IN THE FIRST WORLD WAR by Jim Sheridan, TICKER TAPE & V-­SIGNS and JIMMY RIDDLE by Peter Cox, THE MAN HIMSELF by Alan Drury. Workshops and Lectures; Robert has been invited to talk about participatory and inclusive theatre and film in China (Beijing Film Museum), Japan (Tokyo, Fukuoka and a residency in Osaka), Ireland, France, Finland (Tampere Festival), Spain (Andalucía National Theatre, Seville), Poland (Borderlands International Arts Project), India (Amnesty International Festival, Delhi) and Palestine/Israel (with the British Council in Jerusalem, Gaza and West Bank) and across the UK including RADA, BFI, Westminster and Scottish Parliaments and the Welsh Assembly. Robert contributes to publications when requested, most recently for Red Pepper.